We have all our UTV Tires and wheels on sale for your RZR TeryX Rhino and Commander. Get all the top UTV Tire brands at the super sale prices for ITP DWT Doonz and Sedona Tires. ITP team member John Angal drove his No. 1921 UTV Inc. / Lonestar / FOX Polaris XP4 1000, equipped with 30-inch ITP Ultracross tires, to victory at the Best In the Desert Series opener this past weekend, Jan. 9-10, in Parker, Ariz. Team ITP captured first overall with Angal's car and also took third overall in the class behind the efforts of team member Ryan Poelman (Supercross.com) in his Cognito Motorsports HellRaiser XP1K. Johnny Angal and co-pilot Eric Ringler won the 1900P class at the 2015 BITD season opener in Parker, Ariz., using ITP Ultracross tires on their No. 1921 Polaris. "We can't think of a better way to kick off the new racing season than winning the Best in the Desert opener behind another solid performance from Johnny Angal," said Ryan Edwards, Tech Support Representative / West Coast Race Coordinator. "The 8-ply, 30-inch ITP Ultracross tire continues to prove itself as the tire of choice for these harsh desert environments, as both Angal and Poelman used it to reach the podium at the challenging Parker 250." The THR Motorsports Parker 250 featured a record breaking number of entries (138) between bikes, quads and side-by-side vehicles, according to BITD. The side-by-side UTV ranks had nearly 60 total entries, including 43 in the 1900 Pro class ranks alone. Racers had to complete two laps of the grueling, fast-paced course to stand atop the podium. Angal and co-pilot Eric Ringler were the first to finish, completing two circuits in 3:06:32.473. This was Angal's second straight desert win coming off the Baja 1000 victory last November. Using ITP Ultracross tires on his No. 1918 Polaris, Justin Lambert finished sixth in the 1900P class at the Parker 250. Third place went to the No. 1962 Polaris of Poelman, who was assisted by teammates Dodge Poelman and John Hoffman. They finished roughly eight minutes behind Angal to secure third place on the 1900P class podium. Team ITP racers tallied seven of the top 10 finishing places in the 1900P class, including places sixth through 10th. Justin Lambert (Justin Sheakley, Jeremiah Staggs) of Cognito Motorsports took sixth place just in front of Can-Am / ITP / Murray Racing's Derek and Jason Murray. Michael Isom and Kadin Isom were eighth, Cody Nygren and Ashton Hempwill took ninth and the tandem of Brian Bush and Drew Schultz captured 10th. The no. 1917 Can-Am of Murray Racing finished seventh at the opener, but also extended its string of BITD finishes to 32 races. The team also ran 30-inch ITP Ultracross tires in Arizona. With its unique, non-directional tread pattern, Ultracross tire, offered in 30x10R-14, offers superb traction in a wide variety of conditions and varying surfaces. The open tread design, 8-ply carcass and 14-inch diameter makes it ideal for desert racing and for use with a variety of wheel choices. - Greenball Corporation is returning to SEMA, this year placing extra emphasis on their efforts in the light truck and UTV markets. Greenball will introduce new light truck tires under the Centennial brand, and GBC Motorsports (Greenball’s powersports division) continues to pave the way for tire development in the growing UTV market. 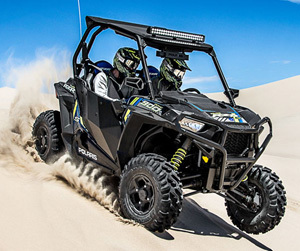 The GBC Motorsports Dirt Commander is the stock tire on the 2015 Polaris RZR S 900. In addition to developing new size offerings for current tire models, Greenball will be introducing the new Centennial Dirt Commander M/T at SEMA. The new mud terrain tire will join the Centennial Terra Trooper A/T, Terra Trooper H/T and Terra Commander, which will be on display at the show. For years GBC Motorsports has paved the way for UTV tire development, and while the Mongrel has dominated the market for racers and enthusiasts alike, the ever-popular GBC Dirt Commander is back in the spotlight heading into 2015. This year’s SEMA booth will be highlighted by a 2015 Polaris RZR S 900, one of the new Polaris models that will come stock with GBC Dirt Commander tires. Come see Greenball at SEMA at booth #43185 in the Lower South Hall near the Chrysler display. Team ITP racers earned 11 total Grand National Cross Country class championships at the conclusion of the round 13 held in Crawfordsville, Ind. Following up its 17-podium performance at the previous round, the team earned eight class wins and 11 podiums at the AMSOIL Ironman, the series finale. Kyle Chaney and co-pilot Chris Bithell, winners of three rounds this year, took eighth place at the AMSOIL Ironman GNCC, but scored enough season points to win the GNCC XC1 Modified SxS class championship in their ITP Terracross tire-equipped Can-Am Maverick 1000R, which was dressed in pink for Breast Cancer Awareness Month. "To come away with almost a dozen GNCC championships is a testament to the determination of our racers and the overall makeup of ITP tires," said Pat McGuire, Public Relations / Race Support. "It's one thing to be competitive, but it's another step when you're the victor. But winning a championship is so much more rewarding because it's the endgame and what all racers hope to do. No matter the age group, gender, vehicle of choice (ATV/SxS, 2WD/4WD), our entire team of racers was extremely competitive and at least 11 of them accomplished their objective and ours." The Ironman finale featured round 13 of the GNCC ATV championship series as well as the sixth-and-final stop in the SxS championship series. Ironman, a fan-favorite, features many hills, creeks, mud, high-speed fields and even a motocross section. This year's course was highly appreciated by fans and racers alike. The fact that many championships were to be decided at Ironman might also have had a little to do with the spectator and racer turnout. Tim Farr (JB Racing / Can-Am / ITP) won the XC1 Modified class and SxS overall at the AMSOIL Ironman GNCC in Indiana, to push him to third place in the final class standings. The side-by-side racing on Saturday was huge for Team ITP, as two supported racers secured championships with solid finishes and two others finished on both the overall SxS podium and XC1 Modified class box. Kyle Chaney (Chaney Racing / Can-Am / Turnkey UTV / ITP) carried a 28-point lead heading into Ironman and ended up winning the class title by 24 points. He took eighth in the class, overcoming a small mishap that took out his vehicle's sway bar in the first turn, to earn his first GNCC title. In the same class, ITP support racers and JB Racing / Can-Am teammates Tim Farr and Larry Hendershot Jr. each made the XC1 Modified podium using Terracross R/T XD tires. Farr, who offered his co-pilot seat to Angel Knox, earned his first victory of the year to push him to third place in the final season standings. Hendershot finished third out of a field of almost 40 UTVs to secure sixth overall on the year. Marcus Pratt (Jack's Excavating) piloted the No. 4 Can-Am Maverick, wearing ITP Terracross R/T XD tires, to fifth place in his class at Ironman to win the GNCC XC2 Limited SxS class championship. In the XC2 Limited class, Jack's Excavating II / Can-Am Maverick racer Marcus Pratt came into the race owning the points lead and simply needed to score enough points to grab the title. And although the ITP driver ended up fifth out of 28 drivers, he scored enough points to remain out front and gain another SxS title for the team. Although Angel Knox had already secured the WXC (premier) class championship after round 12, she still suited up (twice) in Indiana. Rather than cruise around the course, the Honda racer instead capped her title-winning season with her seventh victory of the year. ITP-supported Honda racer Angel Knox won 2014 GNCC WXC class championship at round 12, but wrapped up her season with two wins (one as co-pilot with Tim Farr) at Ironman. Mark Batson put an exclamation point on his 2014 season by winning the Vet B (30+) class for the sixth time. His older brother Dale, who had captured the 35+ C morning class title, also competed at Round 13 and also earned a victory. Multi-time GNCC champion Dave Simmons notched another win (his ninth of 2014) in the Super Senior (45+) division. Junior B (22+) champion Justin Paul tried his hand in the Junior A (22+) class and was sixth. (Center) Dave Simmons took home the ATV Amateur Overall Award at the Ironman GNCC and also won the Super Senior (45+) class championship using ITP tires on his Yamaha ATV. ITP team riders also scored a few more class wins at Ironman. Kevin Cunningham won the Sportsman A/B class on his ITP-clad Honda in Indiana. Jordan Digby won the 125 Sr. (12-15) to end up third in the class standings. Marti Lantz (Girls 8-15) posted her first win of the year. Honda racer Kevin Cunningham won the Sportsman A/B class on ITP tires. A few other racers were in the running for a class championship all season, but came up a bit short. Schoolboy A/B (12-15) racer Westley Wolfe ended up third overall and had four wins. Dylan Walraven (90 Open 12-15), Greg Covert (College A 16-21) and Brandon Icard (College B 16-21) all ended up third overall in their respective classes. Women's Amateur (13+) class racer Kelley Deloach had a nice weekend at Ironman, earning second overall and tying for the class points lead. However, the KTM / ITP racer had to settle for second overall due to losing the tie-breaker, having had three victories to the winner's four. Shawn Stuck (35+ C) and Rich Little II (4x4 C) each finished second in their class. Kenny Rich Sr. won the GNCC Masters 50+ championship this season riding his Suzuki outfitted with ITP Holeshot GNCC tires. The 2014 GNCC season will officially conclude with its post-season banquet Friday, Nov. 21, in Morgantown, W.Va.
ITP today announced the introduction of its new "Hurricane" wheel for side-by-sides and utility ATVs. The first ITP wheel in the new "Storm Series" product line, the Hurricane features eight sets of X-shaped wheel spokes and an ITP exclusive "Rock Armor" inner wheel lip to provide unequalled structural integrity. The Hurricane boasts a 1,200-lb. load rating and is backed by the company's "Lifetime Structural Warranty." "Is the Hurricane the strongest UTV wheel on the market today? We think so!" notes Rhett Turpin, ITP Powersports Director of Sales & Marketing. "Plus, no other wheel matches its unique, automotive-like center design. We think owners will really appreciate standing out from the crowd." The all-new heavy-duty aluminum alloy ITP Hurricane wheel, the first wheel in the new Storm Series wheel lineup, offers an unbeatable X-pattern design, an ITP-exclusive Rock Armor inner wheel lip and a stunning black finish. ITP credits the new wheel's exceptional strength to the interlacing of the center spokes in an X-shaped pattern, the same configuration that's been used in building construction for thousands of years. The proprietary ITP Rock Armor inner wheel lip, which is designed to guard the sidewall of the tire against rocks and debris, provides additional tire protection. The new Storm Series wheel line is about "weathering any storm the trail throws your way," according to Turpin. The Hurricane wheel is expected to arrive at dealerships in November 2014, with additional wheels appearing in January 2015. ITP will initially offer the Hurricane wheel in three size variations (15", 14" and 12") for both UTV and utility ATV applications. Side-by-side racer and Ohio resident Kyle Chaney led the way for team ITP at the John Penton Grand National Cross Country race, winning the XC1 Modified class in his home state. Team ITP-sponsored side-by-side racers earned second and third place in Class 19 (SxS) podium at the 2014 Tecate SCORE International Baja 500 in Baja California, Mexico. Branden Sims and Justin Lambert finished second and third, respectively in the gnarly desert endurance event. ITP also had ATV Pro Josh Creamer reach both the Pro and Pro-Am podiums at the New England ATV Motocross series in Maine. "We were pleased with the results from this weekend, earning numerous podiums in three very different racing venues and terrains," said Pat McGuire, Public Relations / Race Support. "Anytime you finish on a SCORE podium, let alone finish, it's an accomplishment, but to have two teams make it on the box at the Baja 500 is even sweeter. Kyle Chaney's back-to-back victories in GNCC racing is very rewarding for both him and ITP." John Penton GNCCThe Wiseco John Penton GNCC race, a highly popular round hosting for the 25th time, in Millfield, Ohio, featured both ATV and side-by-side racing. Team ITP came away with eight class victories and 17 total podiums. Making the biggest headline for the squad was Ohio native and side-by-side racer Kyle Chaney, who kept up his winning ways by taking the XC1 Modified class and side-by-side overall with his ITP-supported Can-Am Maverick 1000R. ITP ATV racers Westley Wolfe and Carter Kerens also each made the overall podium in their particular sessions of GNCC racing. Chaney Racing / Turnkey UTV / Can-Am / ITP racer Kyle Chaney and co-pilot Chris Bithell won the XC1 Modified class for the second straight race. Second into the woods, Chaney soon found his way out front and never looked back to earn his second win of 2014 and third straight podium with his Maverick side-by-side dressed in with ITP Terracross R/T XD tires. The victory expanded Chaney's XC1 Modified class points lead to 13 with two rounds remaining. Three other ITP-supported side-by-side teams made the XC1 Modified class top 10. Jack's Excavating / Can-Am / ITP pilot Mouse Pratt earned fifth in the class. And JB Racing / Can-Am /ITP teammates Larry Hendershot Jr. and Tim Farr took seventh and eighth, respectively. Farr's finish kept him in the top three of the GNCC SxS Championship points race after four races. ITP-backed ATV amateur racers tallied a spot on the 10 a.m. overall podium and the overall Youth session podium. Westley Wolfe once again took second in the Schoolboy A/B (13-15) class aboard his Greg's ATV-supported Apex, but his finish was also good for second overall on the 10 a.m. box. Youth racer Carter Kerens earned third in the 90 Open (12-15) class and third overall. Team ITP had amateur class wins from Dave Simmons (Super Senior 45+), Donnie Pruett (Silver Masters 55+), Brandon Icard (College B 16-21), Mark Batson (Vet B 30+), Jack's Excavating's Shawn Stuck (35+ C), Parker Henderson (70 CVT 6-11) and Jordan Digby (125 Sr. 12-15). Henderson, Icard and Pruett all lead their respective classes in points after eight rounds of racing. ITP riders also tallied several other podium finishes in Ohio. Greg's ATV / ITP racer Kenny Rich Sr. (Masters 50+), Dale Batson (35+ C), Glenn McConnell (4x4 Sr.) and Marcus Pratt (XC2 Limited SxS) all earned second-place rides. Also, Greg Covert (College A 16-21), Justin Paul (Junior B 22+) and Kelley Deloach (Women's Amateur 13+) chalked up third-place finishes. Tecate SCORE BAJA 500Seventeen side-by-side vehicles entered Class 19 at the 46th running of the Tecate SCORE International Baja 500 event in Mexico. The racers had to navigate a course of almost 450 miles through rocks, deep silt, cliffside trails, sand and desert-wash conditions. Eight vehicles failed to complete the race, and those nine that did reach the finish line fought hard every step of the way, overcoming SCORE trophy trucks, class 1 cars and racing gremlins. "We were so proud to have two ITP racers on the Class 19 podium, as just finishing the race was many of the racer's objective. Branden Sims and Justin Lambert have had a great year and this continues to build momentum for both drivers," said Ryan Edwards, ITP tech support representative / West Coast race coordinator. "It was such a gnarly course this year and all ITP racers reported no tire or wheel failures, despite a lot of the trophy trucks and other UTVs getting flats." Team ITP had two of its supported racers finish in the top three, despite the challenging conditions and numerous "bottleneck" slowdowns. Earning second in Class 1900 was the Lonestar / ITP XP1000 piloted by Branden Sims, who was the sole driver. The team, which included Sims, Jacob Carver and Justin Krause, finished with a time of 13:15:15, roughly 13 minutes behind the winner. Riding on 30-inch ITP Ultracross tires, Sims avoided flats that plagued many other drivers to earn yet another desert racing podium for ITP this season. Coming off his recent victory at the Silver State 300 Best In The Desert event, Cognito Motorsports / ITP racer Justin Lambert tallied another podium on the season, earning third-place finishing spot in Class 19 at the Baja 500. Lambert, and his teammates of Justin Sheakley and Jeremiah Staggs, compiled a time of 14:26:14 in the team's Polaris XP1000 that was dressed with ITP Ultracross tires. ITP and Bush Racing racer Brian Bush teamed up with UTV Inc. owner Johnny Angal to drive a custom UTV Inc. RZR to fourth overall in the class. The Murray Racing / Can-Am / ITP team of Derek and Jason Murray, Monty Aldrich and Steve Amarine ended up seventh in the Baja 500, but tallied enough racing points and bonus points to maintain a hold on second place in the Class 19 standings after three rounds of racing. NEATV-MX 4Round four of the 2014 NEATV-MX schedule visited Hemmond's MX in Minot, Maine. BCS Performance / Can-Am / ITP Pro Josh Creamer battled in the Pro and Pro-Am classes. He won three of four motos and made both podiums. Competing on ITP Quadcross MX 2 front tires and Quadcross MX Pro Lite rear tires, Creamer finished third in the Pro class with a 1-5 scorecard and posted a 1-1 sweep in Pro-Am class. Team ITP ATV and side-by-side racers competed in two different series across the country the last weekend in September, and came away with two Pro class victories. ATV Pro racer Adam McGill won round 11 of the Woods Extreme XC Racing series at Husted Hills in Amesville, Ohio. ITP-supported racers Kevin and Matt Shrive teamed up to win the Production 1000 Pro class at the AVE Racing PURE 250 in California City, Calif.
"No matter if it's an ATV in the woods or a side-by-side in the desert, our racers once again proved that ITP tires offer an industry-leading design and real-world results," said Pat McGuire, Public Relations / Race Support. "With five of the top six finishers and the overall class winner in the PURE 250 SxS Pro class, our tires more than speak for themselves in the desert." eighth place. However, he took the lead on lap two and kept pouring it on. Two sub 11-minute times on laps three and four extended his lead even more. In fact, McGill recorded the fastest lap on the final eight laps of the nine-lap race to win the class and the ATV overall. He won the overall and class by more than five minutes. He has seven wins and eight total podiums in the nine WEXCR rounds he has attended in 2013. Another ITP-backed WEXCR competitor, Mark Batson, won his class in Ohio. He led every lap and won Quad Vet 30+ class for the sixth consecutive race. Batson, who finished the Husted Hills event 10th in the overall quad results, has eight class wins this year. on lap later. By the end of lap four, they took over the class lead and held it all the way to finish line. ITP racers took five of the top six finishing positions in the SxS Pro class. Logan Gastel ended up third in the class and joined the Shrives on the podium. lap five, ended up sixth. Team ITP racers won six classes and earned 15 podium finishes at round six of the 2013 AMA Mtn. Dew ATV Motocross National Championship series held in Virginia. Saturday, June 8, ITP Pro class racers Josh Creamer and Jeffrey Rastrelli finished sixth and seventh, respectively, on a rough, wet Birch Creek Motocross track. ITP racer William Lloyd earned third place in the Pro-Am class podium Sunday. "Despite the less-than-ideal racing conditions, our team of ITP racers did well at round six of the AMA motocross series by winning six classes, earning a Pro-Am class podium and having 15 total class podium finishes," said Pat McGuire, Public Relations / Race Support. "We won four classes in the youth ranks, led by Noah Mickelson's two wins, and also had victories from age-class racers William Lloyd and Dalton Hicks." Round six of the 2013 Mtn. Dew ATV Motocross National Championship series, which also served as the Bob "Smitty" Smith Memorial Race, was soaked by rain prior to the event. The rain and overcast skies didn't let up until just before the Pro class racing on Saturday afternoon. In Pro-Am class action, Lloyd (JB Racing / ITP) led the way with is third-place finish. The podium finish pushed him to third in the class standings. He also won the Junior 25 Plus class using his ITP tires to extend his class points lead. Dalton "Bubba" Hicks of Root River Racing / ITP won the 450 A class and took sixth in the Production A ranks and is the points leader in both classes. Noah Mickelson won both the 90 Open class and the Super-Mini (13-15) class in Virginia. The young Root River Racing / ITP-supported racer now leads the 90 Open class in points and in third in the other class. Maddison Guyer competed in three classes at round six using ITP tires. With a 1-1 moto sweep, she won the Girls (12-15) class for the fourth time and is the current points leader. The final ITP racer to notch a class overall win was Brogan Guyer, who won the 90 CVT (8-15) class. He's currently three points behind the points leader in third place in the point standings, but has the most victories - three - of any racer in the 90 CVT (8-15) class. Vet 30+), Megan Manshack (3rd, Women's) and Blake Sarver (2nd, Schoolboy Jr. 13-15). Racing) each earned a top 10 finish at round seven. Creamer posted a sixth-place finish in moto one and fifth in the second moto to earn sixth overall. Creamer said he selected the wrong tire size for the conditions in moto one and a very narrow track hurt his chances to compete for a podium at round seven. "There weren't a lot of places to make a pass in moto two, but I knew I had the speed to get into the top five and really had to work hard to get up there," said Creamer. "I was really hoping to find the box this round, but I'm going to come out swinging next round and make my way to the top of the box,"
While Creamer was disappointed, Rastrelli had a more positive view of his career-best seventh place finish. The young ITP Pro racer tallied seventh place in moto one and eighth place in the second moto, which put him seventh overall and right behind Creamer. More importantly, Rastrelli, who has earned 27 points the last two rounds, overcame a slow second moto to earn his best finish ever. In moto two, Rastrelli and another rider bumped at the start and soon after that he crashed. However, the ITP Pro recovered to climb into the top 10 and eventually finish eighth showing the poise of a true professional. Fellow ITP Pro, Root River Racing's Sean Taylor was 15th and fifth in the Pro-Am class, in which he's currently third in the standings. Round seven of the 2013 Mtn. Dew ATV Motocross National Championship series heads to Steele City Raceway on July 6-7, in Delmont, Pa.
Former AMA ATV Motocross National Champion Josh Creamer has announced that he will be using ITP tires throughout the 2013 National ATV MX race season. As you may recall, Creamer dominated the 2010 ATV MX Nationals for his first major title, then competed on the West Coast in 2011. Josh moved closer to his native New England for the 2012 season and won both the Pro and Pro-Am championships in the highly competitive NEATV MX Series. Josh states, "Team BCS/Can-Am and I are really excited for the 2013 AMA season! With ITP and their great new product on board, this is going to be a great year!" ITP is proud of its racing heritage and will continue to support the sport with its “MX Bucks” and “XC Bucks” contingency programs in 2013. Since 1982, ITP has grown into the world's #1 ATV/UTV aftermarket tire and wheel source, and continues to provide a complete line of innovative tires and wheels for virtually all ATVs and UTVs in both recreational and competitive categories. Contact us to submit news to this site.